Age Wave’s breakthrough research on women and money includes the recent research study A New Era of Women and Financial Planning: How Financial Advisors Can Best Meet Their Needs and the acclaimed Women, Money and Powerstudy. Ms. Dychtwald is the author of three books: Influence: How Women's Soaring Economic Power Will Transform Our World for the Better, Cycles: How We Will Live, Work, and Buy, and Gideon's Dream: A Tale of New Beginnings, an illustrated children’s book on personal reinvention. We were recently able to spend some time with Maddy in Age Wave’s Emeryville offices. Historically, the financial services industry has focused its attention, energy, and resources primarily on men. This made a lot of sense in the past because the majority of household financial and investment decisions were usually made by men. But times have changed dramatically and with it, financial roles and responsibilities in families have also changed. We’ve seen a critical mass of women—bolstered by rising education levels, unprecedented workforce participation, and escalating income and wealth—assume more powerful roles in personal and family financial investing and decision making. This includes women from all walks of life: single, in a committed relationship, married, divorced, and widowed; women with and without children; and women within and outside of the workforce. Study after study reveals that money holds tremendous emotional value for most women. This was further validated in one of Age Wave’s more recent studies when a significant margin of women surveyed said “the best thing about having money was the security that came with it.” Women’s fear of poverty runs deep at every income level. At the heart of women’s emotional connection to money is their intense interest in and concern for family. In Age Wave’s most recent study of women conducted on behalf of LPL Financial, A New Era of Women and Financial Services: How Financial Advisors Can Best Meet Their Needs, women told us that when it comes to making financial decisions, “life” and “family” are not just small talk but the key themes that drive their financial priorities and goals. As a result, most women report that they want their financial advisor to understand their lives, not just their money. I’m not suggesting that men don’t have the same end goal: caring and providing for their families. However, while many men are more likely to focus most of their financial decision making conversations with their advisors on data and numbers, it’s different for most women. Family issues and concerns should be considered the jumping off point for most financial planning conversations that women have with their financial advisors. 2010 marked a historic moment in terms of the composition of the U.S. workforce. For the first time ever, there were almost as many women in the workforce as men. And when you examine the professional office workforce, the numbers are even more remarkable: 51% of those workers are women. We have reached a tipping point where women no longer have to try to fit into the workforce but, instead, will be standing side-by-side with men in equal or greater numbers to design the future of the workforce and workplace. Obviously, more women working translates directly into increased earning power. If we look at income growth over the last several decades, there are some indicators that may be a harbinger of things to come. Since the 1970s, men’s income has NOT grown at all when adjusted for inflation while women’s income has grown exponentially. I know everyone rolls their eyes, and says, “Look where women started,” but you have to start somewhere and women are catching up and, in some measurable ways, even surpassing men. Former Secretary of Labor Robert Reich, one of over 100 people I interviewed for my book, Influence: How Women’s Soaring Economic Power Will Transform Our World for the Better, told me that he believed that, overall, in the next 10 years, the average woman would earn more than the average man. And that changes everything, especially when it comes to financial decision making. The good news is that we see signs of women’s economic impact rippling through various aspects of our world--in the workplace, in the marketplace, in every aspect of our lives. Just to hone in on one example, a Catalyst study points to the fact that when companies appoint more women to their board of directors and senior executive committees, it actually improves their bottom line. Several other studies have corroborated this fact. And by the way, there’s a “magic number”: you need at least three women on a board of directors in order to have the desired effect. Having just one is typically seen as a token, and having two does not have the desired impact. But once you have at least three women on a board, suddenly you see mentorships emerging between board members, coalitions and collaborations being formed, and the women’s agendas being taken more seriously by everyone, all of which has a very positive effect on a company’s profitability. Employees, too, begin to realize that the values of both men and women are being reflected in the way the corporate board or executive committee performs—and this has a positive effect on performance and employee retention. When the roles and responsibilities of women morph, it has a striking effect on men. As one expert I interviewed for my book put it, back in the 1980s women were given the opportunity to walk in the world of men through work: they got to row with both oars. Up until now, most men couldn’t do that; they were pigeonholed almost exclusively into the role of primary bread-winner. But today those boundaries are beginning to loosen up, providing men with more choices. In the 1970s only about 3 percent of married women earned more than their husbands. Today that number has grown to 26%, giving a lot of men the opportunity to get more involved in family life and household responsibility. While working on my most recent book, I held discussion groups all over the country. One of the surprising comments I heard from men in their twenties, thirties and forties was that they felt sorry for boomer men, who didn’t have the opportunity to take on a larger role in their family life. I remember one man in his mid-twenties who said, “I really want to marry a woman who earns more than I do, because I’d like to be the stay-at-home parent. I love kids.” The younger guys in the group were nodding their heads—but the older men, those in their sixties and seventies-- looked at this guy like he was an alien. The days when men take the de facto solo lead in financial planning for couples and their families is becoming a thing of the past. The emerging model is a more collaborative partnership in terms of long- term financial planning and investing. This process is not always easy for client couples or their financial advisors, but it is increasingly what clients say they want and need. In our national study on women and money, we found that two thirds of women want equal responsibility with their partners in household financial planning decisions. Only one in five women wants their partner to take the lead. 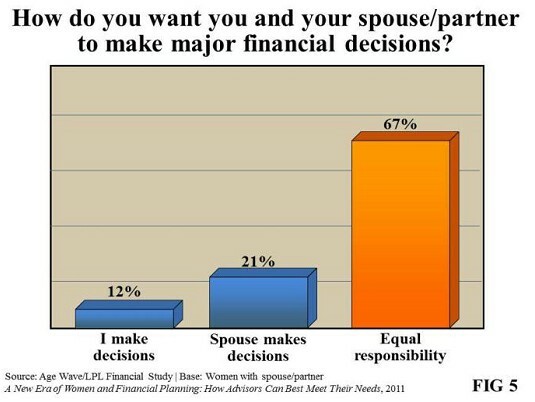 As increasingly more women want to be equal partners in financial decision making, so do men. More and more men say that when it comes to financial decision making, they are seeking a collaborative partnership, with 41% of men reporting that they want their wives more involved in financial decision making. The top two reasons why men want their partner to be more involved are: (1) so their partner will know what to do in case something were to happen to them, and (2) to help their partner better understand the difficult financial decisions they need to make together in these challenging times. I made the point earlier that, overall many women investors are seeking financial security and peace of mind. At the same time, as our population is rapidly aging, older adults—women and men—are also gravitating towards products that can provide these same financial goals. This suggests that annuities are a potentially good option for an increasing number of investors. However, the product is often overlooked or misunderstood by investors. The best step that the annuity industry can take to better position their products with women and older adults is to describe their products in plain English. Financial jargon and terminology in general can be confusing to women and men alike and act as a barrier to entry. Using clear, transparent language is especially important to women clients. Our national survey revealed that female clients are more likely than male clients to admit that terminology used by financial professionals and companies can be confusing, making it more difficult to make financial decisions. There are so many different types of annuities that often women and older adults don’t have a clear picture of what products best meet their needs and why an annuity might be right for them. If there is a simple way to describe the differences in products in terms of benefits rather than just features, investors might have a better sense of why a particular annuity would be of value to them. And be sure to describe both the benefits and the disadvantages of a particular product. Both women and men appreciate complete transparency. They will know you have their best interests in mind if you disclose both the positive and negative aspects of any product.